I’m still here! Yes, I didn’t get hyped up and give up after my first post….its truly amazing. Been busy this week between working full time and balancing this business start up. It’s a lot to tackle but I’ve decided to dedicate myself to this first year of really documenting and having you come along FROM THE BEGINNING and not telling the story of my success after. I thought it would be more fun if you came along for the ride. In fact, I’m feeling SO good about this journey that I’m going to also start a podcast to go along with it so you can hear the pain and joy of my struggles through my voice. I do have a little (a very little) experience with podcasting, so I’m going to JUMP RIGHT IN without even having any music or voice overs. That will come later. Balls in! I feel like because my inners want me to WAIT that I’m NOT going to wait. I’m just going to do it. Gulp! I’m feeling a bit ill now. So this week, I listened to more great podcasts from Anthony Tran, Kim Doyal and Matt Medeiros to keep me pumped and inspired. Good stuff going on out there and I highly recommend you tune into them too. Updated main point of contact email to sam@samanthameeker.com. Ordered business cards. Checked out moo.com but were more than I wanted to pay. So I went with Overnight Prints because not only were they more reasonable on my wallet but they have top quality paper for their business cards. Maybe I’m being picky but I never liked it when a person would give me a low quality business card. Installed recommended plugin called CoSchedule for posting efficiency along with posting to social sites as well. Set up an initial appointment with a business coach! Putting my skin in the game! I’m feeling like I’m floundering a bit and I REALLY want to take it to the next level. Reached out to some friends who need their websites refreshed to include in my portfolio – very good experiences! Set up an appointment with another client for site refresh. Research more networking groups for small businesses. I feel I did not prioritize this well enough. Although I peeked around at meetups here and there, I did not sign up or reach out to anyone to find out more possibilities. I definitely feel a bit scared about it but feel I can overcome that feeling. Research more Word Press backup options. I looked a little bit here and there but felt I lagged a bit on this. Again, in researching, I felt I could have had more gain if only I reached out to people to see what their recommendations are. There it is again, this discomfort in reaching out to people I don’t know. Uggh! This is obviously something I need to overcome. Purchase and begin reading Jab, Jab, Jab, Right Hook – Finish by May 1st. Reconsider pricing plans for websites – post something on site – refer to Anthony Tran’s site not in design but rather how he puts the price out there. I really like how he had his upfront because I personally like to see prices up front….at least to get an idea or a range so I feel like other people will too. Bring value to clients with a free download. Reach out to people regarding small business networking. Conferences? Local networking? Reach out to people regarding WordPress backup options. Meet with new business coach on Wednesday. Wrap up new client’s website. Take 15 min each morning to build Twitter following. Share 2 people’s posts that I feel brings value to potential clients/day on Twitter. Create a giveaway for my site with a CTA to bring value to people while building my list. How to start an introduction….hmmm…I’ve thought of a zillion ways to do it and it’s getting me nowhere so I’m just going to start. 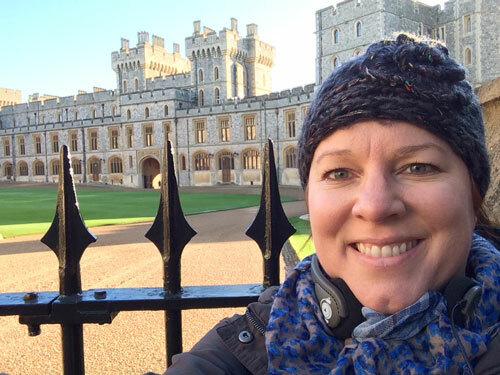 This picture was my selfie at Windsor Castle in England in December, a few weeks after I was laid off. I decided that London could help me get over getting that surprise punch. My name is Samantha (aka ‘Sam’), I have four daughters, three cats and a wonderful, supportive husband. I work full time in the corporate world as a web developer (I was fortunate to find another job within weeks of my layoff…wheew!) and am looking forward to eventually sustaining myself from my own business. I’ve decided that with my love for web design and development, that this would be the best fit for my entrepreneur journey. I’ve tried my hand in a few other startups, including owning a membership based website for couponing to owning an online art gallery and a brick & mortar art gallery as well. They all have led me to believe the ONE thing in common with them all….web design & development. That was always my favorite part. I also have had numerous people ask me for my business card when they find out I’m a web designer. It got so bad that I began to avoid telling people what I did as my full time job because they would want my card and were interested in me doing some work for them. It was like someone had been hitting me in the head all these years without me feeling it until FINALLY the light went on….HELLO….you should be doing this as YOUR business! So here I am, at the very beginning of this journey and I’m going to work hard to post weekly updates to keep me motivated and have a running documentary of it through all the struggles and gains. I’m also going to have an additional blog post to bring value to the community with tips and tricks. Researched and bought Genesis Pro Pack – like the security, ease of updating and use. Purchased Gravity Forms – LOVE it! So used to building mine from scratch! Selfie for website – OMGosh this was SO hard and I need to redo it (x100)! Pick theme & design for website – daunting and changed it like 3x. Doing clients sites is SO much easier than my own! Podcast subscriptions – I love Podcasts and found several good ones including WordPress Chick and Marketing Access Pass. Those two are my favorites so far. They are packed with great info and interviews. Proposal maker – (that’s what I’m going to call it) found one called Bidsketch that I think I’m going to go with. Researched Mastermind groups – I looked on Meetup.com and Facebook and wasn’t really happy with what I found so far. Going to have to ask around about this one. Create a signature for my blog posts that include my photo & a small title.